Numerous historical texts going back to the 15th century sing Angelica's praises as a wonder herb, mostly because it was believed (erroneously) to cure bubonic plague. From that happy association, it developed a reputation as the go-to herb for whatever health problems were pesky at any particular time -- a kind of cure-all panacea. Just give 'em some angelica tonic and send them on their way. This went on for a century or more. Lucky for us, angelica is as useful in the kitchen and in the garden as it was thought to be in the sickroom -- or almost. It has a lush and tropical appearance that makes a nice backdrop for less showy plants and herbs. It also grows to a nice height, over five feet, and fills in nicely. For such a large herb, it manages to appear lacy and somewhat delicate, thanks to its flowers, which grow impressively large umbels. A native to northern Europe, angelica loves rich humus and a nice, large planting hole. It also appreciates light shade in warm weather regions. Provide regular watering and good drainage, and give plants room to spread out, about three feet. Although it isn't fussy if the above requirements are met, angelica is happiest when planted in slightly acidic soil. A native to leafy dells near running water, think of this herb as a woodland transplant and provide it with a moist spot away from wind and punishing heat. A nice protective layer of mulch twice a year is also a good idea. If you're looking for a great companion for angelica, choose sweet woodruff. Woodruff loves the same conditions and is a nice groundcover. Although it does tend to be pretty hardy, angelica can attract pests, including aphids, red spider mites and leaf miners. Plants may also be somewhat susceptible to leaf spot. For the best results, start plants from fresh seed. Because angelica seeds tend to stay viable only a short time, it's a good idea to plant them out directly in the garden as soon as they're mature -- usually at the end of August, or thereabouts. They need a good frost to quicken. I have tried overwintering seeds and only succeeded once when I kept them in an airtight container in the refrigerator over the winter months. Even at that, only about 20 percent of them germinated the following March. Chop young shoots into spring salads (both sweet and savory). Steam and serve shoots as you would asparagus. Sautee angelica shoots in stir fry. Make candy with its ribbed, hollow stems. It's somewhat similar to the way you would candy ginger, and like candied ginger, candied angelica can be used to treat stomach upsets and motion sickness. Use it as an ingredient in pie filling much as you would rhubarb. In fact, it is sometimes served with rhubarb. 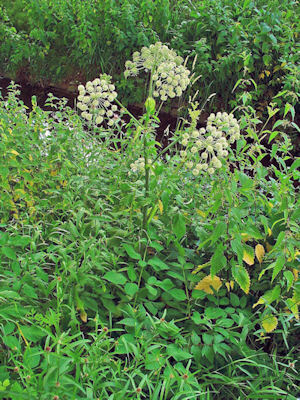 Use Angelica seeds to flavor jams, preserves, chutneys, bitters, liqueurs and gin. If you do any canning or pickling, it's fun to experiment with it. Angelica is a natural antibacterial agent, so it does have beneficial properties when used as a remedy, but its reputation has taken a few hits over the last 400 years or so. You probably won't find it on a list of top 10 (or even top 20) herbs with health benefits. Given the hype, it was bound to have some image problems eventually. After all, at one time it was purported to cure just about everything but a rainy day. 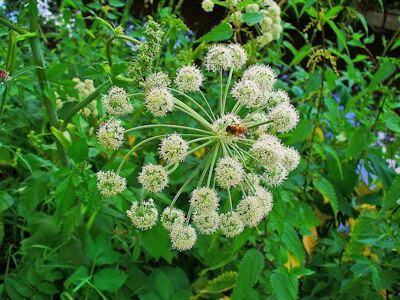 Angelica has also been used as a diuretic and was employed in the past to induce uterine contractions. Herbs used for medicinal purposes are often more concentrated than those used in cooking. Angelica leaves, stems and seeds are generally considered safe culinary ingredients, and angelica root is typically considered safe when applied in external salve form for pain treatment. It is contraindicated as an herbal remedy for pregnant or nursing women. In large doses, it also increases sunlight sensitivity. For the latest medical information about this or any other herb, visit MedLine Plus (a service of the U.S. Department of Health and Human Services), The National Institutes of Health and WebMd. Discuss any medical conditions or symptoms you have with a medical professional before adopting or changing your current course of treatment. This is the famous legend associated with angelica's angelic reputation and name: In a prophetic dream, a monk was told -- possibly by the Archangel Michael -- that angelica could cure those afflicted with the bubonic (black) plague, so the monk spread the word far and wide. The rest, as they say, is history -- and maybe an excess of faith and no small amount of desperation. Angelica usually blooms in May. Its association with the Archangel Michael may have persisted because it blooms early in the month, around the 8th in parts of Europe, which also happens to coincide with the feast day of St. Michael the Archangel celebrated in the Catholic faith. The dried leaves of angelica were used in exorcism rites, too, and the plant was (and perhaps still is) considered an herb of protection that can repel evil spells and spirits. *A biennial plant is one that has a two year life cycle. It becomes established, goes dormant in winter (usually) and revives the following spring to set seed and die. Typically, leaf growth the second year is spotty, so it's a good idea to stagger plantings of biennial herbs so there are always first and second season specimens in the garden. Although angelica is widely considered a biennial plant, it can be notional sometimes and hang around longer, setting seed the third season instead of the second. This has only happened to me once, though. Parsley is another popular biennial you may have in your garden. Avoid growing angelica with dill because it can cross pollinate and result in a less than tasty plant. It will also cross with fennel (I believe), but the results are more favorable. 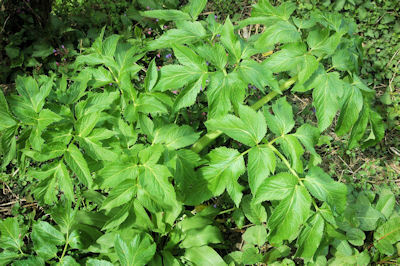 There are actually a number of different angelica varieties, well over sixty. Most do NOT have herbal benefits. Oh, and don't confuse Angelica archangelica with Angelica Sinensis, another herb with medicinal properties that is popular in Chinese medicine. We'll discuss that angelica another day.